All organs and systems rely on the health of the digestive tract. Proper digestion is essential for the body to absorb and utilize the nutrients it needs. In addition, 75% of the cells necessary for the immune system to function effectively are connected to the gastrointestinal tract. 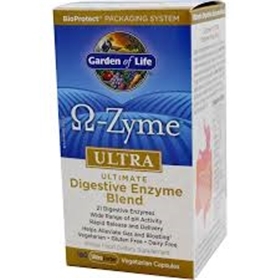 Enzymes are living catalysts and the key to good digestion. Present in all whole live foods but destroyed by cooking and processing, digestive enzymes break down food into nutrients that your body can then readily absorb and utilize. Ω-Zyme ULTRA is the ultimate digestive enzyme formula, supporting more complete digestion of food for gastrointestinal health, regularity and normal bowel function.† This high-activity formula provides a broad spectrum of 21 digestive enzymes specifically selected to digest the full range of proteins, fats and carbohydrates found in a typical meal. These enzymes work together to unlock the nutritional value of foods.